Labor Day did not begin with a picnic. It began with a march demonstrating the power of organized labor. Now Labor Day marks the end of summer for many Americans and, unfortunately, not much more. Too few of us, far too few, understand what Labor Day truly symbolizes – the power of the organized workers who used their collective voices to secure an eight-hour day, a 40-hour work week, a fair wage, and a path to the middle class. Despite these facts, the moneyed elite – the ones who crashed our economy – have distracted the public conversation away from the achievements of the labor movement, demonizing the union worker for having the gall to ask for a fair wage, decent benefits and retirement security. All Americans deserve these benchmarks, but the moneyed elite would have us believe that economic equality would be the downfall of capitalism. How can the labor movement steer the conversation back to the one we should be having? One thing we must do is to remind our nation that the prosperity of the middle class, indeed the existence of a middle class, is tied to a strong labor movement. Organized labor establishes wages and benefits that set a standard observed even by unorganized companies. The labor movement forcefully demanded the economic stimulus that prevented our recent recession from becoming a depression. Furthermore, we must renew efforts to increase the minimum wage, which is a national disgrace at $7.25 an hour. We must take stances that identify ourselves with the 99 percent of Americans who need protections from rapacious banks, outsourcing corporations and corporates raiders, unfair trade agreements, and right-wing extremists who seek to overthrow decades of hard-won social progress, such as Social Security, Medicare and OSHA. 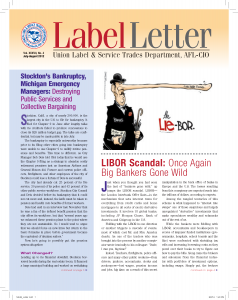 This Labor Day, we must resolve to look for the Union Label, to seek providers of union services in hotels and restaurants and post offices. Just as important, we have to call for policies at every level of government that do the same. Our government should buy American products and services the same way foreign nations patronize theirs. We must demand an end to the vicious attacks on public service employees, who are being scapegoated for a bad economy. The faults in our economy result from the excesses of Wall Street, lax government regulation, corporate greed, and a tax code filled with loopholes favoring the rich. Undoubtedly, right-wing extremists will continue to mislead the public and point the finger of blame at labor, but we must remind everyone that we strengthened the United States and we built its middle class. We face a challenge and an opportunity this year to support both union-made goods and services and expand the ideals of unionism to all Americans. In fact, in the era of globalization, we must unite with our organized workers around the world. The issues facing us are to be found globally and require global action. 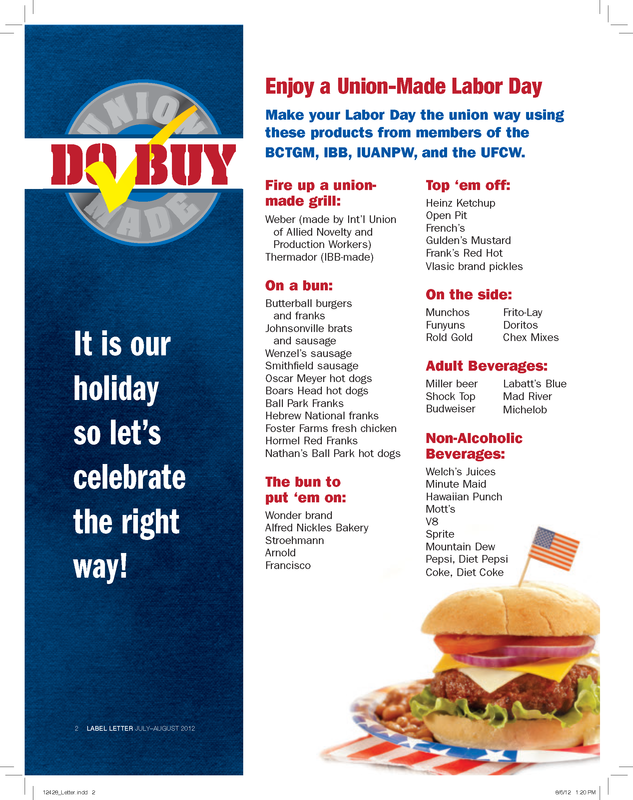 If we are to continue our struggle for a better America, we must revive Labor Day in its original spirit. Now is not a time for optimism based upon the return of a small number of jobs to the US from offshore. Neither is it a time for pessimism because the threats facing us are so severe. Rather it is a time for realism. We have problems and powerful enemies, but we have faced them before and we can overcome them again. The Union Label Department is happy to report that the former Taylor Desk Co, is now A.J. Paull Office. The company has maintained the union workforce and began production earlier this month in the existing facility. On behalf of myself and the former employees of The Taylor Desk Co, I am proud to announce A.J. Paull Office LLC has opened its doors and is manufacturing all of The Taylor Desk Company’s product lines. I am Alan Jay Paull. In 1986 Taylor Chair acquired my family’s business, Eastern Cabinet and Furniture Co/Paull Contract, founded by my grandfather in 1923, which I joined in 1972. Following the acquisition I served as president of Taylor Desk and was responsible for the design and engineering of all casegoods series. Two years ago I redirected my focus and became a consultant to The Taylor Companies. When The Taylor Companies ceased operations on June 8, 2012, I took the opportunity to buy back the company my grandfather had started. On August 1, 2012 PAULL OFFICE began production in the existing 50,000 sq.ft. facility utilizing the same machinery and production methods but more importantly, we have the same skilled and experienced work force. Our affiliation with the Southwest Regional Council of Carpenters, Local 721, continues in good standing. All of which makes PAULL OFFICE an 89-year-old startup company. I invite you to contact us directly for Sales Representation and product information. We are committed to producing high quality wood office furniture, made in America as we have done for the past 89 years. On Labor Day 2013, dignitaries will cut the ribbon on a new $12 billion bridge linking San Francisco and Oakland. It will be a bittersweet ceremony marking the end of a project that employed hundreds of union construction workers under the terms of a Project Labor Agreement. But, the steel assembly for the 52-story building in the center of the bridge and all the decking is a made-in-China product, floated across the Pacific on a barge for U.S. workers to piece together. All the steel on the bridge is Chinese. says the Building Trades had lobbied as far back as the 1980s with then California Gov. Gray Davis to secure a made-in-the-USA requirement for bridge construction. When George H.W. Bush was elected in 1988, all that was swept aside. Initially damaged in the 1989 Loma Prieta earthquake, California lawmaker authorized work to begin on the bridge in 1996. At the behest of then Gov. Arnold Schwarzenegger, the state bypassed the federal Buy American requirement and contracted with the Chinese who formed a partnership with American Bridge and the Fluor Company. No one thought to ask Luffy to explain why, when the Chinese steel workers made roughly $16 a week, for working six days a week and 16 hours a day to produce the steel for the California bridge, that the state was only going to save approximately 3 percent on the total cost of the bridge. Schwarzenegger claimed that sourcing the steel in China would save the state $400,000 million. If that estimate was true (and no one can really confirm it) on a $12 billion project, that figures to be less than 3 percent of the overall cost. Clearly, the estimate doesn’t factor in the positive economic impact that the work would have on the region, the state and nationwide if U.S. workers could have fabricated the thousands of tons of steel components for the eight-mile long bridge. The U.S. lost millions in income taxes, social security contributions and the entire economy lost the spending that decent steel manufacturing wages generate. Furthermore, when initial inspections found that some 65 percent of the welds by the Chinese fabricators didn’t meet specifications, Schwarzenegger had to send 200 engineers and contractors from the California Department of Transportation for an extended stay in Shanghai to scrutinize the work. be outsourced. That’s no longer true today. As Zampa points out, at one time crews of Ironworkers and Boilermakers once built container cranes in ports like Oakland from scratch on the spot with domestic steel beams. Now those cranes come in on Chinese barges for assembly by small crews of U.S. Ironworkers. 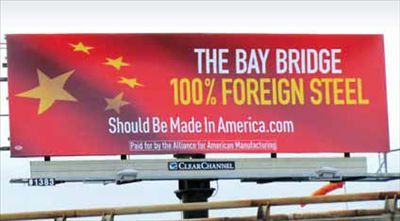 According to Barlett & Steele, China Construction Company, a firm wholly owned by the Chinese government, has been hard at work on public works projects in the U.S. And, although they are using U.S. construction workers, the profits don’t go to U.S. firms, they go back to China. China Construction built the Lake Marion High School and Technology Center in right-to-work South Carolina. The same company built the convocation center at the University of South Carolina in Aiken. China Construction is working well beyond the right-to-work South. They are also performing a major renovation on the Alexander Hamilton Bridge between Washington Heights and the Bronx in New York City and the new train station at New York’s Yankee Stadium.